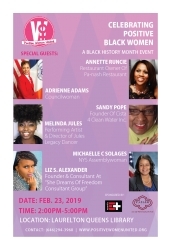 The panel line-up will include: NYC Councilwoman Adrienne Adams, Assemblywoman Michaelle C. Solages, Sandy Pope Founder of Cista For 4 Clean Water Inc., Melinda Jones Performing Artist &Director of Jules Legacy Dancers, Annette Runcie Restaurant Owner of Pa-Nash Restaurant and Liz S. Alexander, Founder & Consultant of She Dreams of Freedom Consultant Group. In September 2017, Positive Women United gained media recognition from NY1/Spectrum News and was named 2017 Queens New Yorker of The Week. In October of last year, they held their first annual Empowering Women in Media event at LMHQNYC in Lower Manhattan. The event which boasted 100 attendees, featured an array of female media professionals ranging from Producers at major television networks such as ABC Networks, to Founders of media and entertainment enterprises who shared their personal stories of perseverance and triumph. “We are really excited about our next upcoming event and continuing to make a positive difference in the lives of young girls and women of all ages,” says President/Founder of Positive Women United, Sylvia Cothia. A Celebration of Positive Black Women will be held at the Queens Library at Laurelton at 13426 225th Street, Queens NY 11413 from 2pm-5pm. The location is easily accessible via the E train and Q5 bus 225th street stop, or via the Laurelton Station on the LIRR. Positive Women United is a 501c3 nonprofit organization dedicated to the empowerment, inspiration, and motivation of young girls and women of all ages. The organization strives to achieve these goals through active advocacy and its mentorship programs. To learn about more how you can get involved please visit the Positive Women United website at https://positivewomenunited.org. We also invite you to stay connected with us in the social media space on Facebook (@positivewomenunited1), Twitter(@positive_united) and Instagram(@positivewomenunited).